Warning with Kerry signing UN Gun treaty inadvertently gave us a warning to us the Tea party. Did Kerry raise the resistance up in high gear Americans? Yesterday, President Barack Obama SIGNED the U.N. gun ban treaty. You know what this means. Now Obama and the U.N. are one BIG step closer to wiping out our Second Amendment freedom, our national sovereignty, and our American rule of law...once and for all. Only you and I can stop Obama and the U.N., but we have to act NOW. 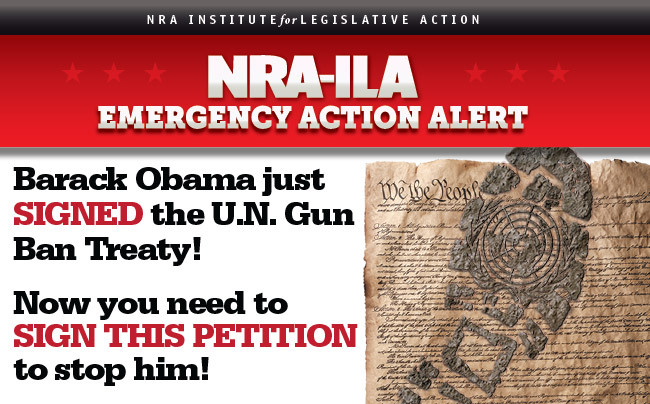 Please sign NRA-ILA's Emergency Petition to the U.S. Senate as soon as you can. Only the Senate can ratify treaties, so it's up to you and me to convince an overwhelming majority of U.S. Senators to vote NO on the U.N. Arms Trade Treaty. And we have to do it RIGHT NOW. We need to line the halls of the Senate with boxes and boxes of these petitions. We need to make it clear to every Senator if they team up with Obama and the U.N. to destroy our gun rights — there will be a heavy political price to be paid at election time. That's why every petition counts, starting with YOURS. So please, sign your petition TODAY. And after you sign your petition, I need you to make a much-needed contribution to NRA-ILA so we can make certain that U.N. bureaucrats never get the chance to trample our constitutional Right to Keep and Bear Arms. With your help now, NRA-ILA can launch a BLISTERING ad campaign that exposes Obama's treachery. We can blanket the Senate with hundreds of thousands of these petitions. We can put every critical NRA-ILA campaign tool to work and stop this dangerous treaty before it becomes the law of the land. But we can't do ANY of it without a generous commitment from you TODAY. So after you sign your petition, I urge you in the strongest way possible to make an emergency contribution of $15, $25, $50, $100, or any other amount you can afford to NRA-ILA today. Only NRA-ILA has the proven track record to win a battle this big. And every dollar you give RIGHT NOW will be spent stopping the U.S. Senate from ratifying the U.N. gun ban treaty. Please take action as soon as you possibly can. And please forward this email to every freedom-loving patriot you know. We need as many signed petitions as possible!!! Please do not reply to this email. If you no longer want to receive future Chris Cox notifications, please click here, and you will be removed immediately! Thank you!